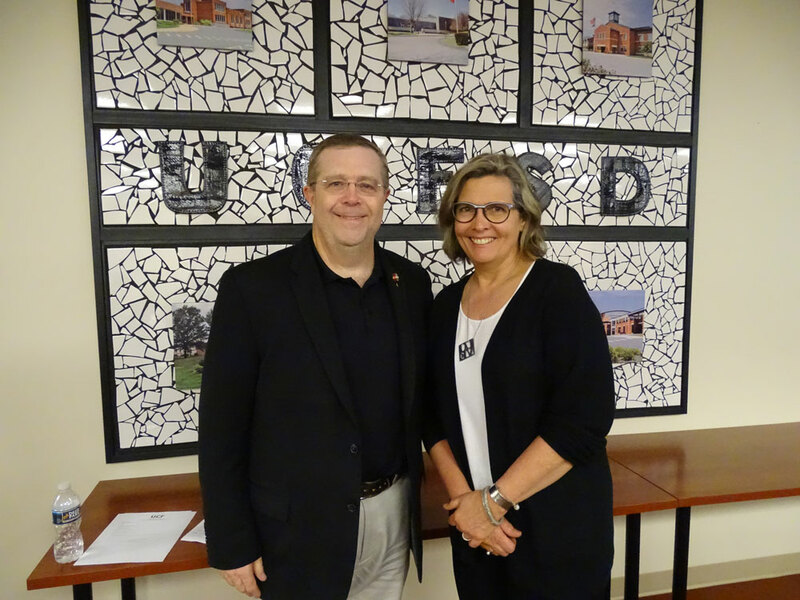 Unionville High School Music teacher Scott Litzenberg and art teacher Heidi Benson are retiring. ” Two colleagues that are irreplaceable,” said Principal Jimmy Conley. EAST MARLBOROUGH — The $87.1 million 2018-19 budget moved forward during Monday’s Unionville Chadds-Ford School Board work session. The final tax levy vote set for June 18. After hearing the financial ramifications from options that would have lowered the tax impact on residents, the Board opted to go with the Administration’s initial recommendation. This keeps the 10-year building plan on track. Also, this year’s projected $.5 million healthcare savings can be earmarked for unexpected future health costs (the district is self-funded). It additionally keeps the unassigned fund balance projected at 5%–which, according to Business and Operations Director Bob Cochran, is board policy—after a five-year period. Board member Tom Day concluded that if the board chose to use the healthcare savings to offset the tax increase, the impact to each Chadds Ford resident amounted to only $2 per month. It appeared that many on the board were not happy with Delaware County’s 6.43% millage increase. Board member Gregg Lindner blamed the state code that dictated how taxes must be split in school districts that span more than one county. The overall 1.56% weighted average increase (the lowest in twenty years) translates to a .35% increase ($27 per assessed property on average) for Chester County residents, and 6.43% increase ($398 on average) for Delaware County. The budget was approved with an 8-1 vote, with board member John Murphy dissenting to protest the state-mandated formula. The Times detailed the budget and the county split formula in the May 12 budget session article. 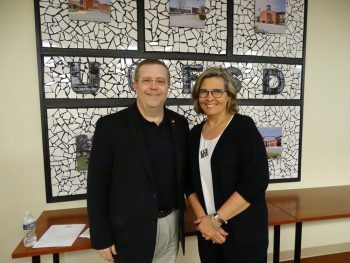 Curriculum and Instruction Director Tim Hoffman, together with UHS Principal Jimmy Conley, reviewed a three-year plan to revamp the high school’s class schedule. The final plan includes increasing lunchtime from thirty-minutes to one-hour and rotates afternoon classes. To find the time for the hour lunch, homeroom would be eliminated, two minutes shaved from each of the seven class periods, and one minute from in-between-class passing time. This “lunch and learn” time could be used by students to connect with teachers for extra help, meet with other students for project collaboration, do homework, attend a weekly club, or de-stress via some physical activity in the gym or courtyard in addition to having lunch. Teachers can use this time to connect with students and increase the frequency of department collaboration and best practices sharing (which, according to Conley, only occurs once per quarter now). Rotating afternoon classes would be helpful to students who need to leave school early for sports or other events. They will not continually miss the same class, as is the current situation. There are challenges that will be worked out via some pilot days planned for next year. There will have to be other places for students to eat (the courtyard, library, etc.) as they cannot all fit in the cafeteria at one time. Ideas include more food kiosks in addition to the cafeteria and the Cyber Café, like “grab and go” boxed lunch stations. Afternoon class rotations would impact some seniors who, for example, take a last period study hall so they can get to work. Classes that have double periods, such as science labs, may not have those times back-to-back. And though no student will be able to leave the building/courtyard, Administration is determining if there should be a way to keep track of each student’s location to ensure safety. The plan is the result of eight months of work by a committee of students, teachers and parents. If approved by the Board during the June Board meeting, “Lunch and Learn” would be added to the 2019-2020 school year, with rotating afternoon classes starting in 2020-2021. The Board also recognized three long-time employees’ retirements. Two high school teachers–Music Department Chair Scott Litzenberg and Art teacher Heidi Benson—are retiring after 20 and 38 years of service, respectfully. Bus driver Jessica Turgoose is also retiring. Next up: Board Meeting May 21 at 7:30 in room 14 at Pocopson Elementary. All board meetings are open to the public. They are broadcasted live (and archived) on the UCFSD web site.